ProFuel Brainmax Reviews: Does It Work? ProFuel Brainmax is claimed to be a high-quality dietary supplement, which delivers improved concentration, augmented awareness and optimized brain function. It may aid you in intensive learning and working sessions, better concentration, and increased awareness. The manufactures of this product claim that it’s a natural antioxidant which reduces oxidative stress in the brain and results in faster visual information processing and enhanced learning capabilities. The extracts in this supplement can also lower cortisol (stress hormone) levels and reduce high blood pressure. It is a finely balanced blend of Ayurvedic plant extracts, B vitamins and trace elements combined with caffeine and L-theanine which may be useful in improving maximum focus, concentration, and increased brain stamina. Who is the Manufacturers of ProFuel Brainmax? Pro fuel is the manufacturer of this supplement. Pro fuel is a German manufacturer for vegan food supplement and the product is exclusively produced in Germany. Brainmax is made up of 100% natural products according to the manufacturer. Brainmax might be able to support brain energy by boosting the metabolic activity of mitochondria, which is the main powerhouse of brain cells. It may also help increase cognitive function by transport fatty acid material into brain cells, where they can also act as fuel mitochondria. This may increase the cerebral absorption of oxygen and other nutrients. Once the brain is supplied with the needed energy, it would be able to function properly. ProFuel Brainmax Ingredients- Are they Safe and Effective? Brainmax claims that its 100% natural. Here are some of the ingredients present in this product. Nootropics are compounds that are known for enhancing cognitive function and performance. Nootropics function by increasing the mental function in the body including memory, creativity, motivation, and attention. Ginkgo Biloba – This ingredient is known for its concentration-enhancing effect and achieves that by improving blood circulation to the brain, which in turn improved the transport of nutrients. Caffeine Blend – Caffeine has a positive effect on the dopamine and serotonin, resulting in a better mood and focused attention. When combined with green tea extract, this ingredient may help the user achieve a quick but long-lasting mental, concentration & alertness boost. Biotin – Also known as Vitamin B7, this ingredient is very crucial in maintaining a healthy nervous system and regulating gene expression. This is very important in helping the brain boost its cognitive function. Vitamin B12 – Vitamins B12 is present to help the natural nootropics present in the supplement. What are the Advantages of the ProFuel Brainmax? This supplement may help boost concentration while increasing mental alertness. 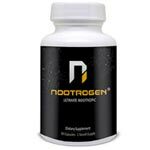 The product may help the user optimize brain function with the help of the nootropics available. The extracts present may help lower cortisol and high blood pressure. It is vegan-friendly as it contains no gluten. What are the Disadvantages of ProFuel Brainmax? Too many ingredients have left this formula over-stretched. None of the serving sizes are big enough. The manufacturer combined Bacopa monnieri and Ginkgo Biloba and the two don’t really work together. This supplement might not work long-term due to the presence of caffeine. The product is not ideal for those with allergies due to the presence of trace amount of gluten, soy, eggs, and milks. How Should You Take ProFuel Brainmax? This Cognitive supplement comes in the bottle which has 60 capsules. According to the manufacturer, it is recommended to take 1 or 2 capsules before starting a mentally strenuous work. The manufacturer also recommends, if using a brain booster for the first time, it is best to start with one capsule per day and increase the dose to two capsules per day after repeated use. How Much Does ProFuel Brainmax Cost? 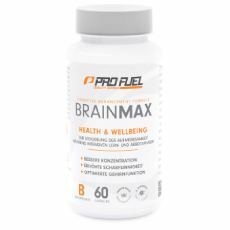 A bottle of ProFuel Brainmax is sold for €17.95 with 60 pills contained in each bottle of the supplement. There is no discount for purchase of multiple bottles. What is ProFuel Brainmax’s Return Policy? The company offers a 14-day return policy with customers given a chance to return the product if they are not satisfied with it. Does ProFuel Brainmax Offer a Free Trial Period? The manufacturers do not offer a free trial for this product. ProFuel Brainmax is a supplement that may help increase cognitive functions. 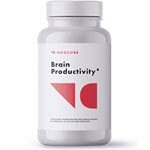 This supplement contains nootropic which may help enhance and boost cognition while learning skills and understanding. The supplement may also help in boosting concentration, leading to an optimized brain function. However, this product might not work long-term due to the presence of caffeine while its combination of Bacopa monnieri and Ginkgo Biloba is a bad one. For those that are allergic to glutens and dairy products, then this supplement is not recommended for them.